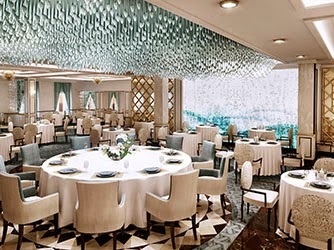 Norwegian Cruise Line said today that when Norwegian Escape debuts it will include a series of new branded experiences in well-known leaders in dining and beverages along with Tony Award-winning Broadway musicals and an all-new Supper Club. Silversea has a nice treat for passengers on their 52 Mediterranean cruises this year. Their pricing now includes shore excursions and wi-fi. Carnival is the latest line to begin deploying a shipboard app for mobile phones. It is currently available on Carnival Breeze, but will roll out to other ships in the fleet over the next 18 to 24 months. It will include both information and communications features. While the app is free, there will be special pricing available for the communications features. At the same time there is some new pricing available for internet access from your laptop. The complete article appeared in the January 15 edition of Cruise News Daily. This summer, Princess Cruises is going to deepen the Alaskan experience for passengers traveling to Alaska with them. “North to Alaska” is the name Princess has given to the program that will let passengers eat like locals, learn from locals and celebrate like locals. The complete story appears in the January 14 edition of Cruise News Daily. 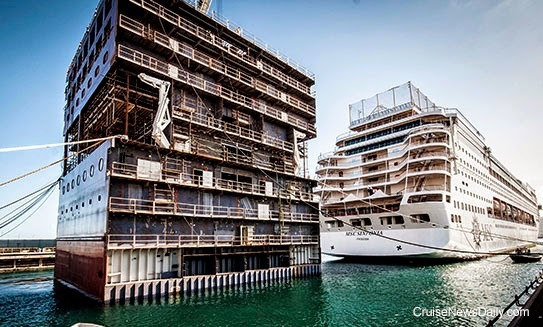 MSC Sinfonia arrived at the Fincantieri yard in Palermo Monday ready for its “Renaissance.” The 200 million euro project by MSC will lengthen the four Lirica-class ships by adding to each a 24-meter midsection containing 193 staterooms. Space in the public rooms will also be added to accommodate the additional passengers. MSC Sinfonia will return to service on March 25. Details are in the January 14 edition of Cruise News Daily. In only about a year and a half, Regent Seven Seas’ long-awaited newbuild will be joining the fleet, and today, the line released the first design details of the small, luxury vessel. With a ship as small as this, 56,000 tons, you shouldn’t look for lots of features. Instead the emphasis will be on dining, entertainment and on the destination. The complete story appears in the January 13 edition of Cruise News Daily. Photos courtesy of Regent Seven Seas. All rights reserved. May not be copied or used without permission.